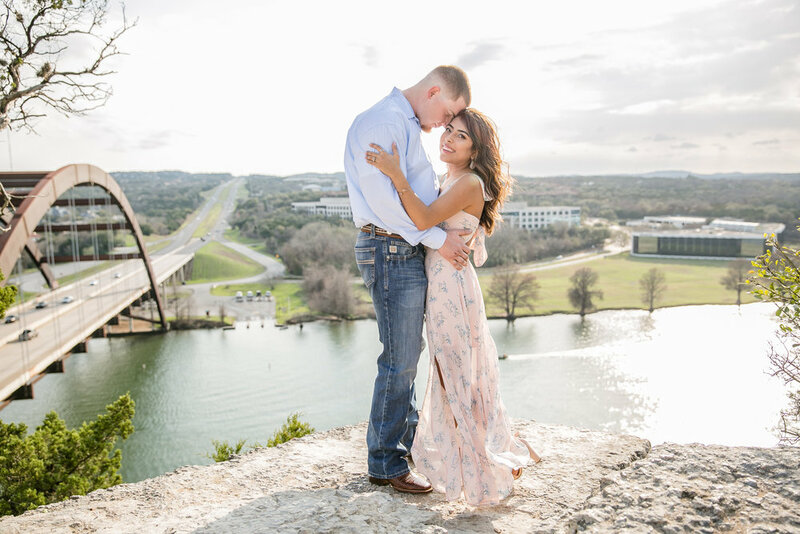 Vanessa & Tyler were so much fun to work with during our session! They decided on their first location for our session at the 360 bridge overlook, which I am very ashamed to admit, that I've never been to. I have been to the Mount Bonnell lookout spot, but there is something so special about being able to look over Austin's most famous bridge. 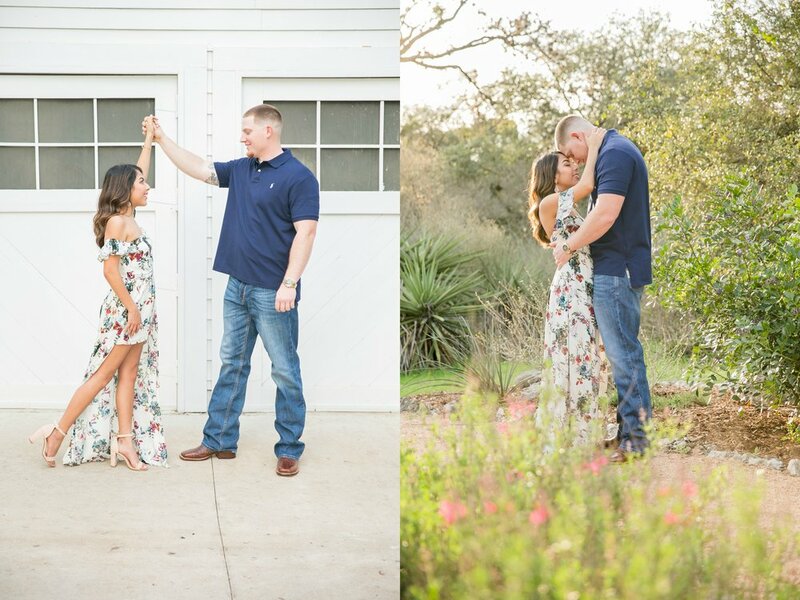 I hope you enjoy these images as much as I enjoyed spending time getting to know my sweet clients even more. The sun was absolutely stunning and this exact location where we were taking photos is where Tyler popped the question to ask Vanessa to be his wife. How amazing is that? How cute are her outfits for this shoot? I absolutely love her dresses-check out the back of the light pink dress! Stunning! I had been seeing these pink flowered trees, also known as a cherry blossom tree, pop up at very random locations throughout Austin & I have been eagerly waiting for one to make an appearance for a photo shoot. 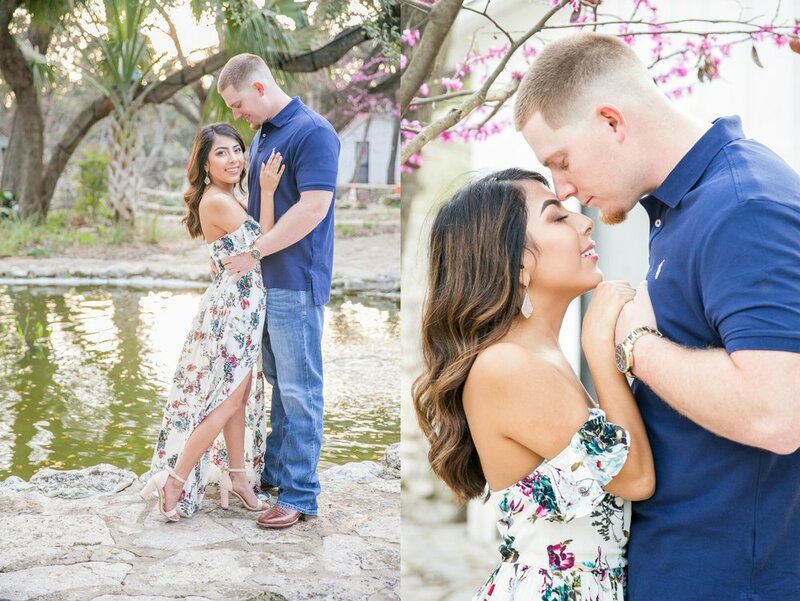 I felt like I had hit the jackpot once we arrived at Mayfield Park because I walked in the gate and there stood one magnificent tree- fresh with pink flowers & ready to show off as a beautiful backdrop for our session. I am so glad we did, because I love having flowers grace the edges, corners and backgrounds of the images I capture. I can't wait for your wedding at Vista West Ranch in November! I truly had an amazing time with you both & I hope you take this time while you're engaged to cultivate and grow your thriving love for one another. Also, I wish you nothing but smooth wedding planning. In the meantime, take it easy, find time to be together and relax before your big day arrives.